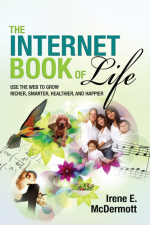 The Internet Book of Life, by Irene E. McDermott | Information Today, Inc.
"Whether you need insight, direction, caution, reflection, entertainment, or fact-checking assistance, The Internet Book of Life can help. … With this book at your side, your computer in hand, and your internet connection poised and ready, you can take on your world—or at least find the information you need in order to do it." No matter what you want to accomplish in life, there are quality, free online resources available to help—if you only had the time to find and evaluate them all! Now, noted author, columnist, reference librarian, and working mom Irene McDermott (The Librarian's Internet Survival Guide) rides to the rescue with this handy guide to websites, blogs, online tools, and mobile apps designed to help real people and families answer important questions, make better decisions, and live fuller, happier lives. From matters of personal finance to parenting, relationships, health and medicine, careers, travel, hobbies, pets, home improvement, and more, each chapter addresses real-life goals, dilemmas, and solutions. The Internet Book of Life, along with its supporting blog, is the lively, indispensable reference that belongs next to every home computer. "Wow, wow, wow! … McDermott has culled together an exhaustive array of subjects for every stage of, well, life. Her invaluable book is now at the top of my 'perfect gift for anyone' list. A superb resource for Google lovers everywhere." "Internet newcomers who want an introduction to a rich set of web resources will find The Internet Book of Life a friendly, information-filled book." "As a working mom and librarian with all the answers, McDermott has taken her expertise and navigated the big bad web for us. She has given us a direct map to the information we need. A super helpful guide … you'll wonder how you lived without it for so long. As a professional organizer, saving time for people is one of my life's missions, and I will use this guide to save time for myself." Listen to Irene on 'Heart to Heart' as she talks about how to use the internet to get travel bargains.